A patient is in cardiac arrest. On call, Penny rushes to assist. Frieda : Not sure, about a minute. We were busy. Penny : Yeah, we all need our beauty sleep. Ukranian Frieda Petrenko is a unique character. With her goth-style clothing, her cynical but blunt honest manner, she still shows underneath she has compassion and vulnerability. 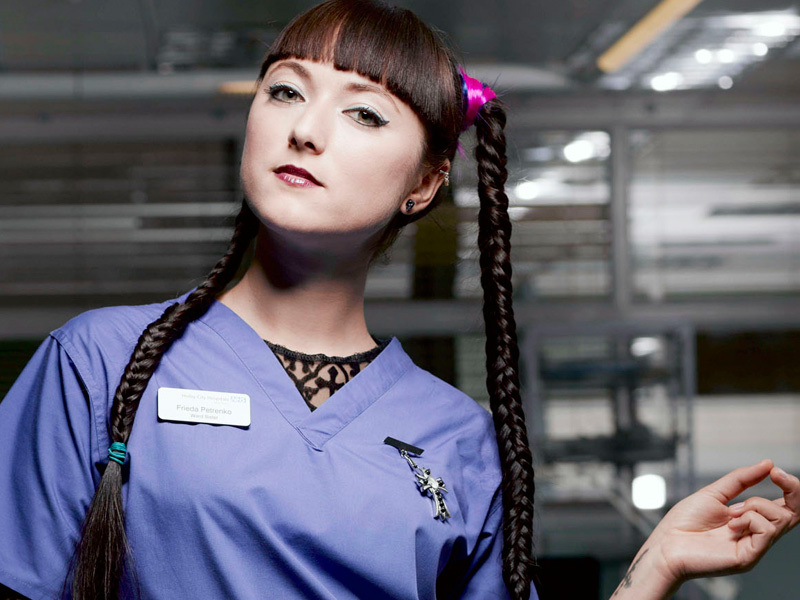 Frieda makes her first appearance as a nurse in February 2010. She then makes a re-appearance in May of the same year and continues her role on the show regularly. In S12 E39, Penny is desperate to impress Linden so, when he challenges her to work with Frieda, Penny is determined to make it work. However, when Penny and Frieda disagree over a case, Penny is forced to pull rank and refuses to accept that Frieda has made the correct diagnosis. In S12 E40, Penny is shown up by Frieda once again when Linden asks Frieda to teach the junior doctors a procedure. Penny asks Frieda to stop undermining her, but soon realises that she needs to play Frieda at her own game. Penny tells Frieda that she and Oliver will meet her in the bar after work but she stands Frieda up, leaving her to spend the evening with Dr Greene. In S12 E41, Linden tries to keep his personal issues with Joseph from affecting his work, but when Frieda calls Joseph to an emergency without telling Linden, Linden is furious. 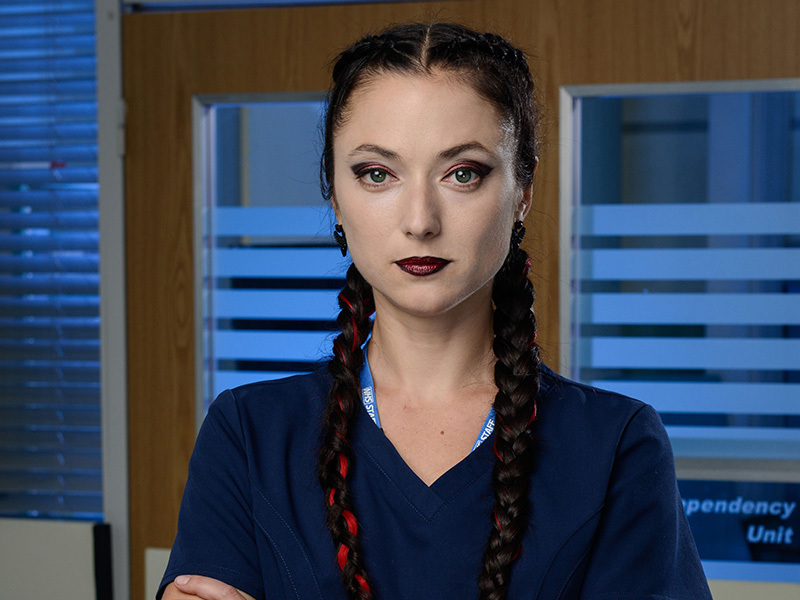 Frieda retaliates by reminding Linden that patients in his care should not suffer due to his personal problems – he later apologises to Frieda. In S12 E45, Penny and Frieda encounter a perverse and disturbed patient. In S12 E47, a patient is racially abusive towards Frieda so she takes her revenge by sticking flowers up his bottom. He makes a complaint against her to Sacha and Penny attempts to back her up. In S12E48, Frieda’s plain talking helps Penny face up to her responsibilities when she has a tough day.In S12 E50, Penny riles Frieda by sucking up to an obviously lazy and arrogant locum, Glynn, who’s working on AAU. When Penny and Frieda argue over a patient’s treatment, Penny sidelines her and makes her feel small. Later, Penny notices Frieda performing a procedure that only a doctor could do and realises that Frieda is a trained doctor. Next episode S12 E51, Penny tries to encourage Frieda’s skills as a doctor but Frieda tells her to stay out of her life. In S12 E53, Frieda spends her 30th birthday doing the night shift, much to her chagrin, but things momentarily look up when an old friend who’s an agency nurse turns up. In S12 E55, Frieda is in a good mood after Oliver asks her out for a drink to say thank you for bailing him out recently. She even considers applying for an F1 job when Penny pushes her. However, when Penny realises the reason behind Frieda’s cheerfulness, she asks Oliver what he’s playing at. Oliver doesn’t want to lead Frieda on and so cancels the drink, causing Frieda to throw her application form in the bin. In S13 E6, Penny and Michael encourage Frieda to come back on to the day shift permanently. She’s reluctant about working with smooth operator Michael but is eventually persuaded to stay after a solving a difficult medical case. In S13 E13, when Frieda learns she’s being laid off, Penny begs her to consider applying for an F1 position; she’s been a doctor before, after all. Frieda refuses at first but a day facing the wrath of the unforgiving Malick might just give her the motivation. In S13 E21, Frieda is forced to rely on Chrissie when she discovers that a difficult patient has a phobia of doctors. She soon realises that alienating the nurses isn’t the best way forward in her new career. In S13 E24, after working closely with Oliver during a shift, Frieda encourages him to retake his F2 year and delete his resignation letter. In S13 E27, Frieda is upset following the shock death of Penny in the previous episode. In S13 E29, Frieda is shocked when her make-up causes an allergic reaction in her patient and she is forced to spend the day make-up free. In S13 E32, Sacha struggles to control his team, as Frieda and Chrissie become increasingly frustrated with each other. In S13 E33, Frieda tries to keep her emotions in check when she receives a call from her family to inform her that her father has died. She returns to the Ukraine on compassionate leave and does not make an appearance until S13 E43, where she bonds with Eddi through their irritation over new F1 Lulu. Frieda decides to have some fun and wind up Lulu by competing for Michael’s attention. In S13 E45, following the death of her father, Frieda is determined to get on with her work. As the pressure mounts, Frieda finds it had to put aside her personal problems and demonstrate her talent as a doctor and surgeon. 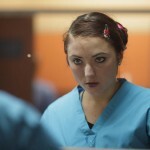 In S13 E46, Frieda is scheduled to assist Michael in surgery but Lulu is determined to fight her for the opportunity. In S14 E3, Frieda gets a mysterious call and leaves Holby for the Ukraine. We next see her in S14 E11, when Elliot arrives in the Ukraine under the pretence of giving a lecture but has been asked to perform a risky heart operation. Whilst there, he meets Frieda, working as a waitress. 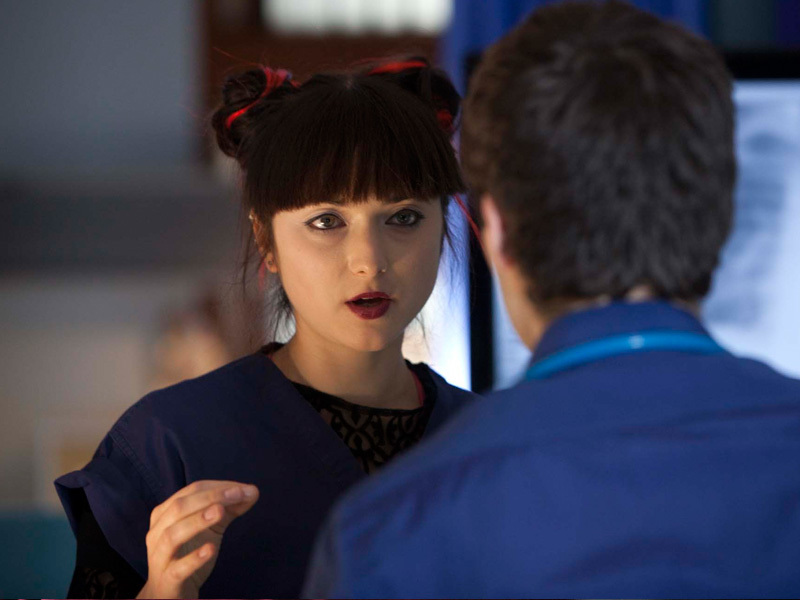 Together, with Michael they help Frieda face her demons and persuade her to return to Holby. In S14 E13, Frieda is gutted having to work with a brusque Luc for the first time, given she knows about Eddi’s departure. Things are tense between the two, as they disagree on the treatment of a patient. Frieda ends up lying to avoid the wrath of Luc, but is surprised at his response. In S14 E15, time is running out for Frieda to complete her F1 portfolio on AAU. With no other consultant available, she asks Michael Spence to assess her. But Michael is nervous, he’s supposed to be on Holby Care only and doesn’t want to fall foul of Hanssen as soon as he’s back. In S14 E16, when high achieving F1 student, Jez Atkins is admitted after an RTA accident, Frieda’s insecurity about her own ability to pass her F1 grows. 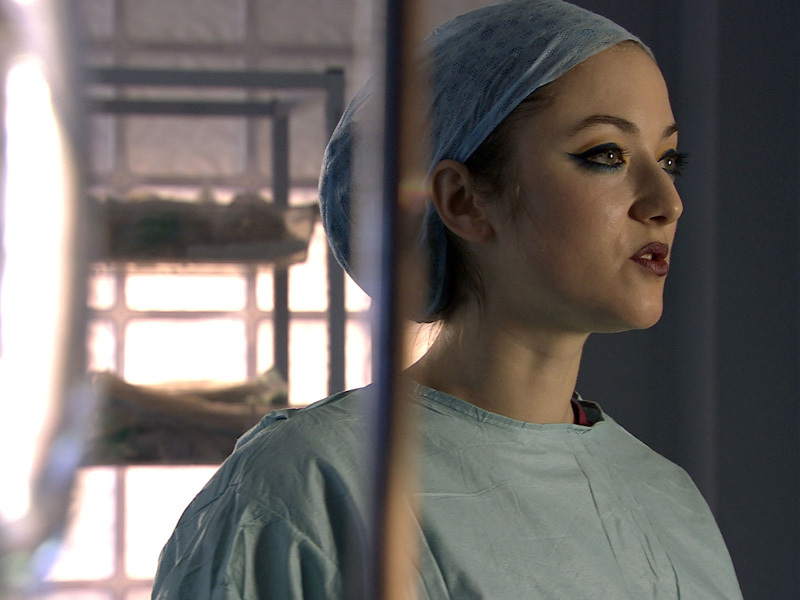 Encouraged by Michael and Eddi, she faces a difficult challenge in diagnosing Jez’s illness. And when Frieda learns she has been summoned to Hanssen’s office for her results, she can only assume the worse for her future in medicine – however she is shocked when he tells her she passed with the highest mark. In S14 E19, Dan uses Frieda to prove his importance and ability to Malick, but when Frieda discusses his patient with Malick and performs a procedure without him Dan demands Hanssen steps in which backfires. S12 E47 – Frieda sticks flowers up an abusive patient’s bum in revenge. S12 E50 – Penny discovers Frieda is a trained doctor. S13 E29 – Frieda is forced to go make-up free for a shift due to patient’s allergy. S13 E32 – Frieda tries to keep her emotions in check after learning of her father’s death. S14 E11 – Elliot & Michael help Frieda release her demons in the Ukraine. S14 E16 – Frieda awaits the results of her F1 exams.